American 12", about 18" x 48" on in-feed side. The problem has been inconsistent results from jointing, mainly an arc in all the stock. 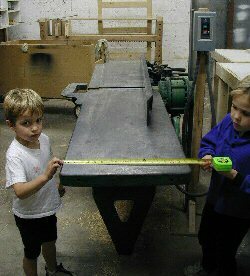 I frequently mill longer boards, so it has been a problem. Shifting the patternmaker's lever on the front seemed to help, but not enough of the time. Investigating with a long straight bar showed in-feed side crowned by about 30/1000ths, enough to make a difference so I thought. Thompson Surface Grinder ca. late 1950's. Dial on lower center raises/lowers stone by .0005ths by mechanical linkage! Center levers control speed of travel and incremental change per pass. Push buttons run magnetic lock. Backside showing fluid pipe; 50 HP motor is in center right. Wheel is about 24d.by 6"
Bottom of in-feed. Trued up only slightly bearing points with stone and long straightedge. In-feed table on check, lifted with forklift and magnetic grabber. Getting table wedged and braced. Not shown: blocks supporting all bearing points under the in-feed table. Indicator showed table low at throat and at end by about 30/1000, about what I had seen at shop with table on beds. Now I had something real I could blame the curvy stock on and it was not I.
Grinder in action at beginning of pass. Magnetic table moves laterally, while wheel moves in and out and up and down, perpendicular to table. Note tiny jack holding up rabbeting arm to maintain flushness to table. Contact with table. Lots of water, but heat still caused table to bow up in center as expected. Solution was to let cool, then make lighter, faster passes to get to final flatness. About half done. Note original scraping marks in bottom right. Table was put on a bed and a sharp tool literally cut iron off the top to flatten. Fascinating to see diamond tool true up such a heavy wheel. Steve trued it up about six times or so during grinding the in-feed table. Blueing sprayed on, then very light passes showed any high spots. Fence: These are actual hand tooling marks made by a long-passed craftsman. The fence was repeatedly scraped with a hard steel tool, and then wiped with a flat plate with bluing to check for high spots. Steve and his brothers took apart and sandblasted the fence. He was going to put it on the grinder, but since it was only out .003 and he felt it might warp if put on the machine, he trued it up by hand. Back on the beds. Straight edge showing gap at end of in-feed before shimming. Holding up one side of table with pipe clamp. Screw side of clamp under table allows minute adjustment. Tables back in place and looking great. The machine works great now. I was really afraid that the grinding would make it look too new and detract from the vintage-ness of the machine. It just looks like an old one in really good shape now. The price was more than fair for the work done. Steve Green and the folks at Production Tool & Die in Charlotte, NC. 704-525-0498. 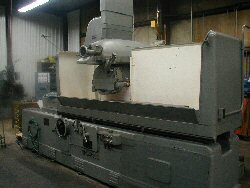 The place is filled with row upon row of perfect milling machines in great shape. One almost expects them to start moving around by themselves in some kind of surreal, art-deco ballet. It was great to find some of the people and one of companies that make this such a great country.